There is nothing better then the first bite of some good blondie brownies. Well maybe one thing...nuts! The ultimate way to add some crunch into any blonde brownies recipe is by adding the ultimate crunch. There are so many variations of blondie brownies you can make and most times the easiest variation is what kind of nut you use. I have tried everything from regular roasted nuts, almonds, cashews, and pistachios, but I always come back to the favorites and for me it's pecans. I also have pecans on hand because they are my son's favorite snack, and we eat them any which way we can. That's why for me, pecans are the perfect additive to any blond brownies recipe. There are a few recipes for blondie brownies on the site, but here's another one that includes the nuts of your choice. I hope you like it as much as we do. Pre-heat your oven to 350 F. and set aside a greased 10" baking dish. To start, mix together all of your dry ingredients in one bowl. Some people like to sift the flour to keep it fluffy but why take the extra steps if you're not going to need it? For these brownies to richer the better. Mix the flour, sugar, baking powder, baking soda and salt. Once all the dry ingredients are combined, beat the one egg into the dry mixture and set aside and start working on the good stuff. In a separate bowl, place the butter in the bottom of the bowl and just sort of mash it down, then on top add the chocolate chips and the pecans and stir it together. Once you have a nice mixture (it will almost look like cookie dough) gently fold into the dry ingredient and egg mixture you first made. Spread the brownie batter evenly into your greased baking dish and then here comes a little extra fun! I take the whole pecans and arrange them on top of the brownie batter and often I do little special patterns. My son goes wild when I spell his name out in the brownies as if they were made especially for him, which many times they are. You can always just do a simple random sprinkling of nuts, but what's the point in baking if you can't have a little fun? Bake in your 350 degree oven for 20-25 minutes or until golden on the top. Because of all of the rich ingredients these special brownies often get dark quick so definitely keep an eye on them. It really is surprising how easily you can take your brownies to the next level. 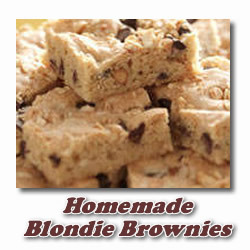 These are some blond brownies that you will go nuts for.